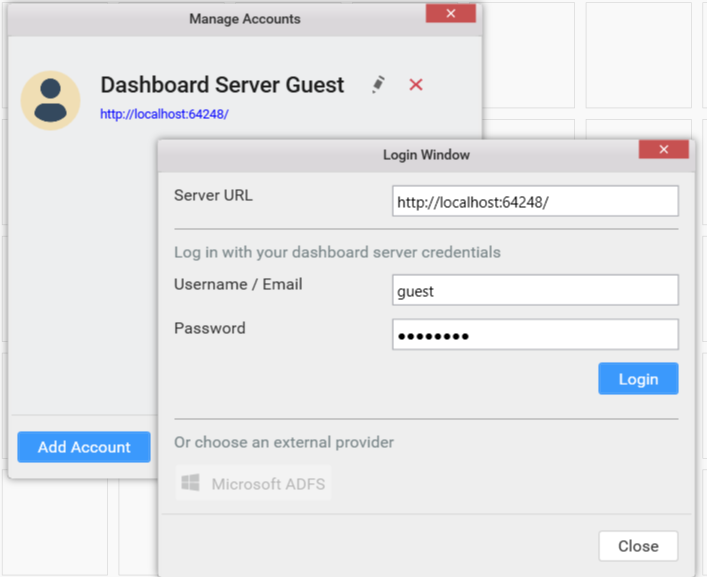 Log into the Dashboard Server through the login window. Login window can be launched through any of the following ways. 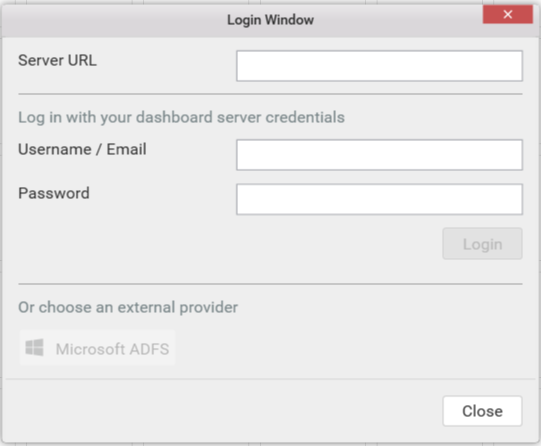 Click the Server menu and select the Login… menu item to launch the login window. 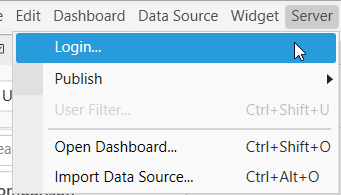 Click the Login option in the title bar and choose the New User Login menu item to launch the login window. Click the Login option in the title bar and chose Manage Accounts menu item in the drop down list. 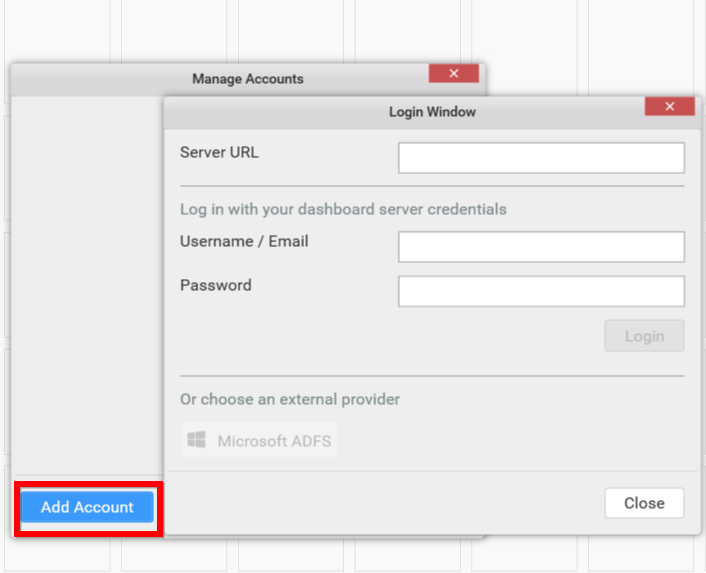 In the Manage Accounts dialog window, click Add Account to launch the login window. 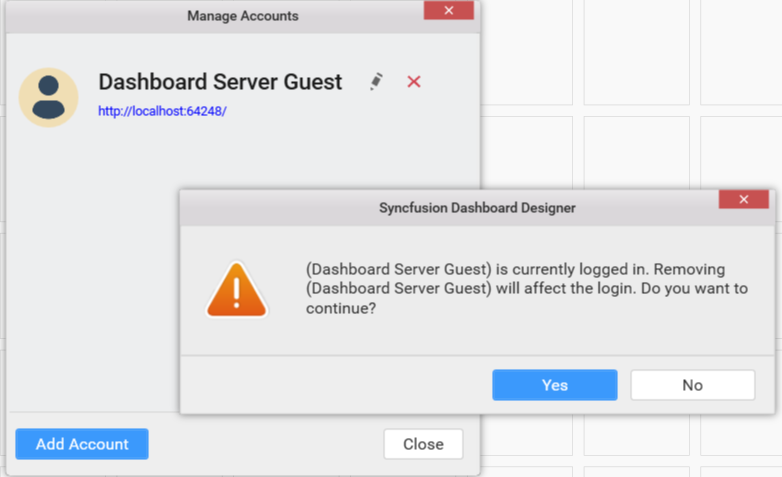 Syncfusion Dashboard Designer provides the ability to configure multiple user accounts of same or different dashboard servers. Through this, current user login can be switched in between these accounts without requiring to feed the user account credentials every time. Manage Accounts dialog maintain all the added user information. Each user account added can be edited and/or removed. Click the Login option in the title bar and select Manage Accounts menu item in the drop down list. Now, Manage Accounts dialog window will be opened. Added user accounts and current login information will be maintained even Dashboard Designer upgraded to a newer version later, until removed explicitly. If the added user is already present in the list, show dialog box to prevent the duplicate user information are added again. To edit an existing user account, navigate to the respective account in Manage Accounts dialog window and click Edit icon highlighted below. This will launch the Login Window to update the details. If provided user information is valid, login will succeed. Otherwise, fails. To remove a user account, navigate to the respective account in Manage Accounts dialog window and click Remove icon highlighted below. If selected user account is the one currently logged in, alert message will be displayed before removing the account from the list for confirmation. To switch the current login between the accounts you added already, click the Login option in the title bar and choose Switch Account option. Navigate to the added user accounts that are displayed in sub menu and select the respective account to switch to. Selected account will then be considered as Current account. When the network disconnected between designer and server, selected user sign-in will not be showed until connection is re-established. 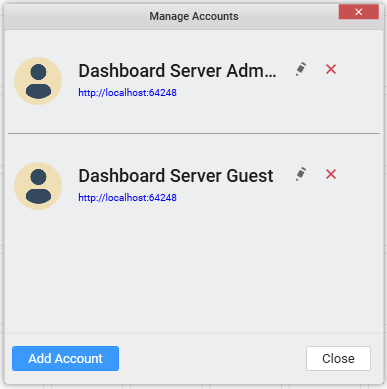 Meanwhile, message Unable to connect to the remote server will be displayed on attempting to connect When you are not logged in currently, you will get Users menu item displayed instead with the configured user accounts in sub menu. You may logout from the dashboard server through any of the following ways. 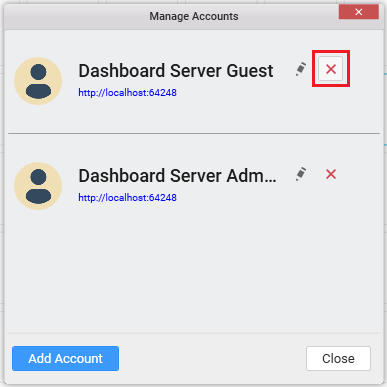 Click the Server menu and select the Logout menu item to sign-out the current user. Click the Login option in the title bar and choose Logout option to sign-out the current user. After the current user logged out, the added user accounts will still be maintained under Users sub menu for re-login later.